Hi guys, I’m trying to apply on ABAQUS to do my MSc thesis, which is about a non linear buckling analysis of concrete filled tubes. 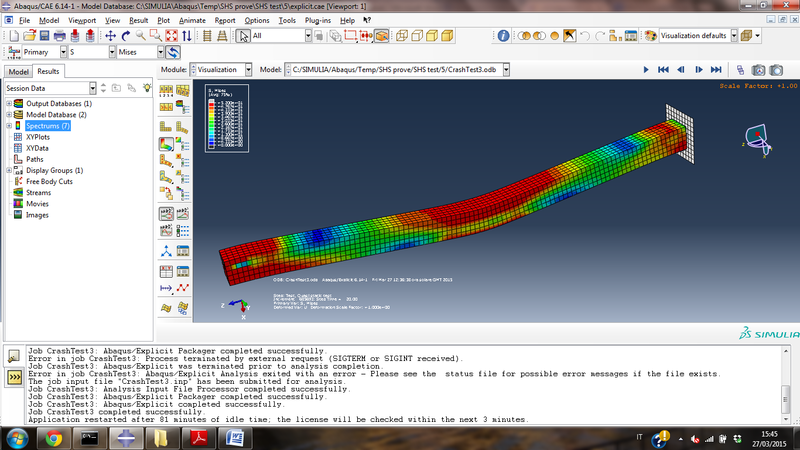 In other words, I have to model on abaqus some compression tests of tubes filled with concrete, including initial deformations, contact properties and at the end load eccentricities. I read that to perform a quasi static analysis with nonlinearities the best way is the Dynamic Explicit Analysis, so I’m reading about that but unfortunately I have some doubts. 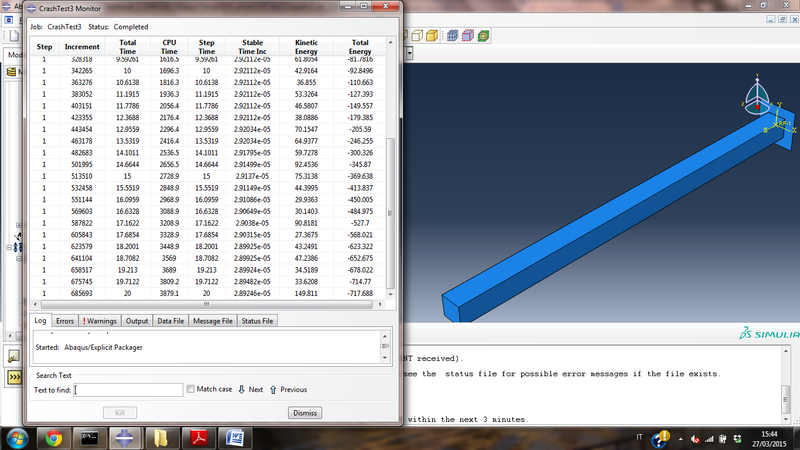 In order to understand how the Dynamic Explicit works I’m doing some test, I modeled just the core of the column (concrete) with solid elements and a coarse mesh (element length about 19mm) and I simulated the execution of the test through a rigid plate with a velocity of 1 mm/s (even if in the real test it was 0.01 mm/s). In the Dynamic Explicit step I used a Time Period of 20 (because I want a displacement of 20 mm) and a mass scaling factor of 50 in the whole model (otherwise the analysis time was too long, but I have some doubts about the other effects of the mass scaling). Because the velocity of the jack it’s fixed during the whole test I used an Instantaneous Amplitude. I get some results but I’m not sure they are right, because the total energy is not so low (-700 peak at the end of the test). However, can you give me some suggestions about my model? Which are the fundamental parameters to care about to perform a Quasi Static Analysis? I’m sorry about my low knowledge but, even if I’m reading every day the manuals I’m learning it by myself, because my supervisor doesn’t understand anything about abaqus.